PHOTO TIP: Taking pictures of signs is one of my favorite things! They are great for scrapbooks, or just for remembering all the Disney touches once you get back home! My home away from home! I love Disneyland!! You truly do leave your cares and reality behind you when you enter Disneyland. I LOVE that quote as you enter DL! I went for the first time in 2010- loved it! I hope to get to Disneyland in 2013 with my family! Going to DL for the first time since I was 5 this summer! Can't wait to see this for myself! 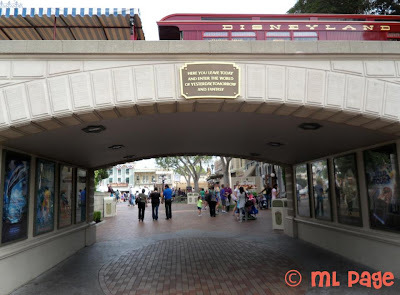 My favorite part of going to d-land is passing under that archway...it really is like entering a whole new world!